Danny Nightingale case: Is the era of the war trophy over? 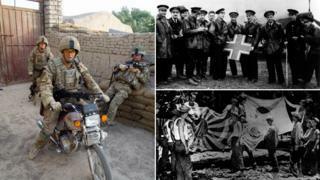 The release on appeal of an SAS soldier detained for keeping a pistol from Iraq has thrown a spotlight on war trophies. Are victory souvenirs now a thing of the past? In the wake of the Napoleonic Wars, some members of the French Imperial Guard stopped at nothing to make sure the British would not get their hands on their most prized military possessions. In their desperation, it was said Napoleon's elite soldiers burned their regimental colours, mixed the ashes with wine and drank the concoction. The bronze eagle standards would supposedly be broken up in similar circumstances. But the French sometimes failed and to this day some British Army regiments' uniforms feature the eagle motif to record a victory. At the end of the Falklands conflict, the 5th Regiment of Argentine Marines are also said to have burned their colours as they surrendered to the British. But why do some soldiers collect the belongings of a defeated enemy? Maj Gen Julian Thompson, who led 3 Commando Brigade during the Falklands War, believes the "irresistible urge" of taking mementos is deeply rooted in human nature. This Taliban flag is now at the Imperial War Museum. Its text is part of an Islamic call to prayer. "War trophies go back to when we were all running around in skins, or not even dressed in anything at all, and you took something from your enemy - his best stone axe - and waved it around in the air to proclaim dominance," he says. History is littered like a battlefield with examples of soldiers taking souvenirs of war. British troops returning from the Falklands were routinely warned to get rid of hoarded Argentine weapons before their arrival in England. "The night before we arrived home the whole ship was surrounded by splashes as the pistols went overboard," says Thompson, who says he never felt the need to take anything for himself. In ancient Greece and Rome, military victories were celebrated by assembling war memorials from items gathered on the battlefield. On occasion, body parts of slain enemies have served as more gruesome war trophies. Trophies have also made gifts for wives and girlfriends back home. German helmets were a popular token of affection and proof of bravery during WWI and WWII. In the Balkans in the mid-1990s, many of Sarajevo's jewellers switched from the tourist trade to engrave shell cases to sell to troops. In more recent times, soldiers have returned home with more benign items, such as vehicle number plates, bullet hole-ridden signs from places they have fought, flags or newspapers. But Thompson also sounds a warning. "What you can't do and what is totally illegal is to steal things off people. If you capture someone and he's got a gold cross round his neck, to steal that as a personal possession is totally wrong." The case of Sgt Danny Nightingale, who was sentenced to 18 months' military detention for keeping a 9mm Glock pistol he says was given as a present in Iraq, highlights a different concern - weapons as war trophies. He was later released by the Court of Appeal but the case echoes that of a grandmother from Dundee who was jailed for five years for keeping a World War II pistol belonging to her late father. She was also later freed on appeal. So what are the rules surrounding the items soldiers can bring back from conflicts? The Ministry of Defence does not have a definitive list of banned items but makes judgements on a case-by-case basis. But, the MoD says troops must comply with the same rules and procedures on taking items on military flights as people on a civilian flight. An official request to seniors must be made to bring a prohibited item, such as a weapon, home. Completely deactivated weapons can be brought back, but again, an application to the soldier's superiors must be made. Thompson says that nowadays only a minority of soldiers will take trophies, perhaps for fear of landing in hot water. "It's less prevalent than it used to be because the rules have got stricter over the years," he says. But given the current controversy - and wider issues over cultural sensitivities - is the tradition still acceptable? Military historian Dr Peter Caddick-Adams says as long as there are wars, trophies will be sought, and the practice is no issue as long as items are not dangerous or offensive. "The taking home of perfectly innocent trophies has always been part of military history and always will be in the future," he says. And sometimes the tradition can result in an unlikely chain of events years later. Tony Banks, who served with 2 Para in the Falklands and now owns a chain of care homes in Scotland, confiscated a trumpet from an Argentine soldier and kept it as a war trophy. "It was totally unique. There were lots of berets, cap badges and bayonets around but I thought to myself that this is probably the only Argentine trumpet in the island," says the Scotsman. The instrument was housed in a small black box with a music book - and in that book the name Omar Rene Tabarez was written. To Banks the name made the item personal and so he never truly felt it was his. He decided, years later, he would track down its rightful owner. In 2010, 28 years on, he made the trip to Buenos Aires, the Argentine capital, to meet Tabarez and return his prize. "I never felt guilty [about keeping it]. The inspiration to return it was purely human interest," he says. "There has to be reconciliation and I felt that this was it."